Last Chance to Register! Employee Giving is Growing at an Unmatched Pace - Learn Why March 26th! Register Now for March 26 Webinar! Have you ever wondered what real difference it makes when employees give through workplace giving programs as opposed to other fundraising methods like Facebook, GoFundMe, or Text2Give? Or maybe you've questioned what makes payroll deduction giving more beneficial to charities, employee donors, and employers as opposed to other donation payment methods like credit card, PayPal, and check? Every year, American employees give to causes they care about through their employers, resulting in $5 billion for the nonprofits who are tackling tough issues and improving the world around us. American generosity has always been incredible, and when the economy does well, charitable giving only grows. Giving USA 2018 found that charitable giving of all types exceeded $400 billion last year, for the first time. And workplace giving—an employer-hosted program which enables employees to donate to charities, often directly deducting donations from their paychecks—is growing at an unmatched pace. One workplace giving program that has experienced such growth is the New Jersey Employees Charitable Campaign (NJECC). Marking its 34th year in 2018, the NJECC has raised nearly $50 million for charitable organizations. 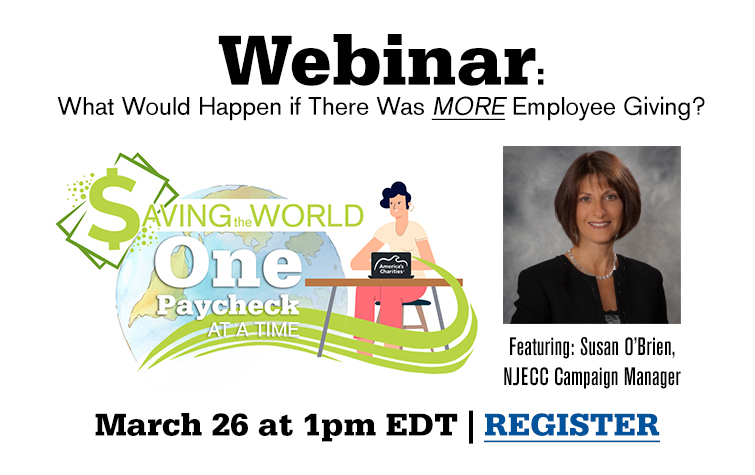 On March 26, join America's Charities' free webinar, where we will interview Susan O'Brien, NJECC campaign manager, to get a look behind the scenes of the NJECC and gain insights to your questions about the impact of employee giving. Click here to learn more and register for our upcoming webinar on March 26.